East Timor Legal News 28 July 2012 Source: The Dili Weekly 26/07/2012 Written by Venidora Oliveira - The Dili District Court (TDD) began hearings into the stoning of a taxi, which occurred on the 19 February 2012 in Balide, Dili. At the hearing, the taxi owner told the court how his taxi was parked at the place and a group of drunken men started throwing rocks at the vehicle destroying it. 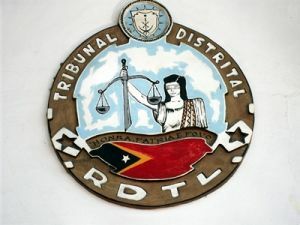 “I didn’t know of any problems, I often park my vehicle there, but this time they just started throwing rocks at my car causing a lot of damage,” said the owner of the taxi at the TDD in Mandarin, Dili. The victim submitted a complaint to the Criminal Investigation Services (SIC) after surveying the completely damaged vehicle. “On the same night I called the Police, who came immediately to the scene of the crime to investigate and the case is being heard in court,” said the victim. The defendant admitted living nearby but rejected the accusation he had damaged the vehicle, saying he did not throw any rocks. “I came home from work tired and went to sleep, but then heard noise and suddenly rocks began hailing on our house, causing my wife and children to panic, so I went outside and asked why my house was being stoned,” said the defendant. “People began running up and down the place, I started searching for my children, then one of my colleagues said the owner of the taxi had told police I was responsible for throwing rocks at his vehicle. So I said let us go to court and I will reply there,” said the defendant. Judges for this hearing were Antonio Elder, Jose Maria, and Antonio Gomes, with lawyers Domingos Barreto and Marcia Sarmento for the Prosecution and Defence respectively. After hearing both parties, the presiding judge asked the defendant to return to the Court July 30 to hear the sentence.